Oval exterior grade gold/black laminate memorial plate, available in two sizes. 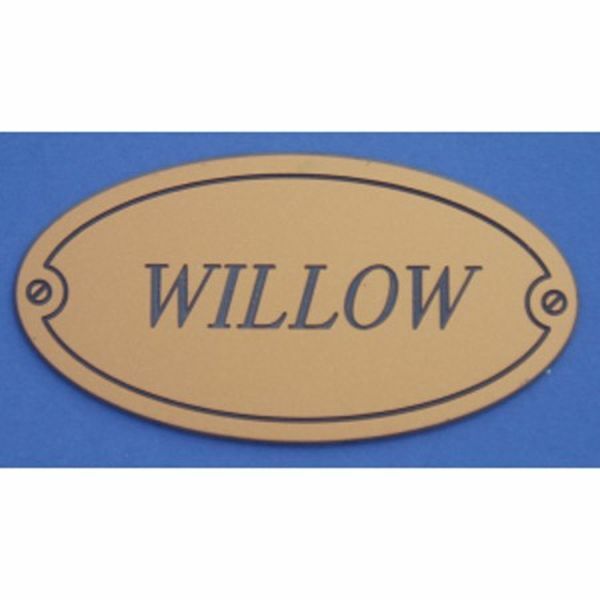 This oval exterior grade gold/black laminate memorial plate is available in two sizes. The largest size oval memorial plate is approximately 144mm x 74mm and the smallest is 104mm x 54mm. Up to 20 characters are engraved free on the oval sign, and additional letters are 15p each. A maximum of 25 characters can be engraved on the oval memorial sign. These memorial signs may be stuck or screwed for fixing. Note that the large oval laminate plate is £11.95, and the postage rate for all this oval memorial plate is Band A.